Today was our first at sea day. When we left Dunedin last night and headed into the Pacific Ocean, it was fairly calm. Since we ate lunch in town, we ordered chef salads from room service for dinner and watched a little TV before calling it a night. About 4am this morning, I woke up to a rocking ship. The waved were up around 4-6 ft. We decided breakfast in the restaurant would be smarter than trying to balance plates from the buffet. The captain turned the ship while we were at breakfast, so the waves were following us and the ship "surfed" for the rest of the day, so it wasn't too bad. We went to a lecture in the theater on Captain Cook at 10:15am. This was very good. The speaker, Sandra Bowern, was very knowledgeable and interesting to listen to. After 10 days away from home, it was time to do laundry. There is a laundry room with 2 washers, 2 dryers, and 2 ironing boards on every floor. Since this was our first at sea day, we weren't the only ones looking to wash clothes. After the lecture, I waited in the laundry room on our floor for a machine to free up, then stuck it out in there until our last load was done. That was the only way to get and keep my spot in line for the machines. 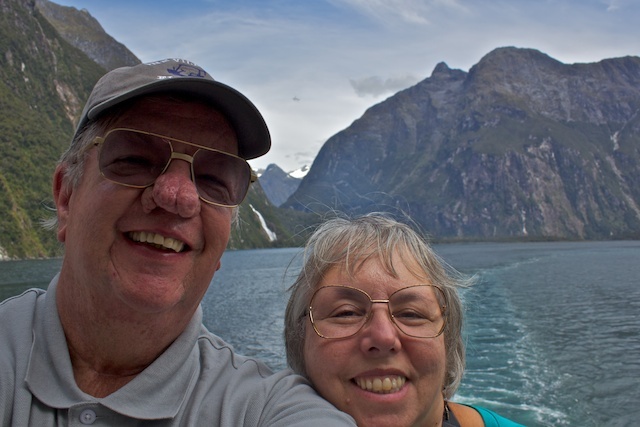 At 3:30pm the ship picked up a pilot to take us into Milford Sound. 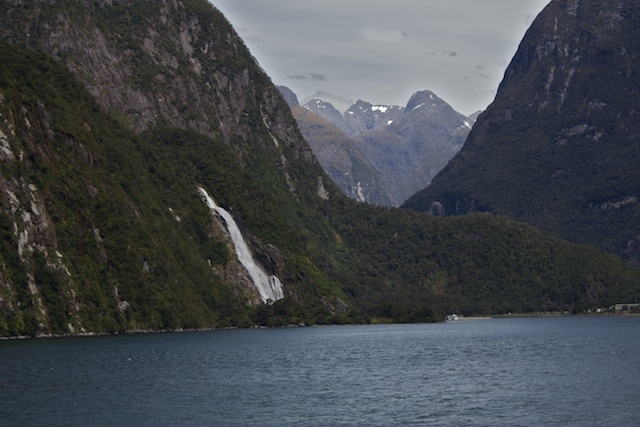 This is an inlet surrounded by spectacular mountains and waterfalls. 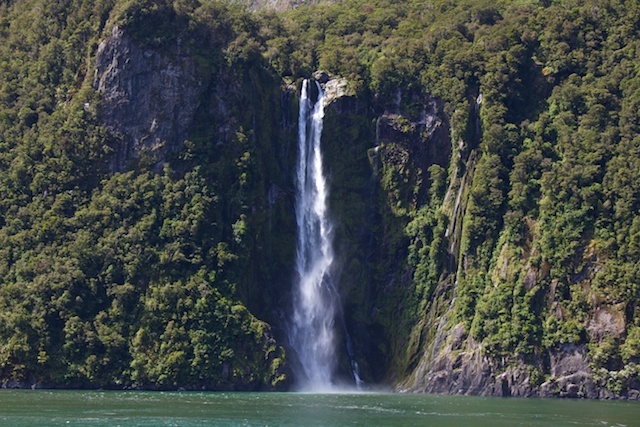 There are 2 large waterfalls that are always running and a lot of smaller ones that come and go depending on the rainfall. We saw at least 6 of the littler ones. We had dinner in the main restaurant tonight and the food selections were the best we have had so far on the trip. We are starting to learn what to order. The seas got rough again after we left the sound. We are now headed for the Tasman Sea and it promises to be a bit devilish (pun intended). Waves are now 9-10 ft swells and it will probably get worse. We are going to be rocked to sleep tonight.